According to the FIFA and UEFA guidelines, the football pitches of clubs – competing on a national or international level – must be kept playable at all times, also during wintry conditions. HSI’s field heating system offers the best quality/price ratio. The heating system will automatically (dis)engage based on preset parameters. This means that the heating system will only be in operation when and where required. All heating systems are provided with remote control. It is also possible to apply section heating for training purposes. The short warming-up time, efficient system operation (only when required) in combination with the limited energy consumption – as a result of the unique combination of IR heating ribbons and system control – make the HSI heating system the most economical worldwide. HSI’s heating system is suitable for application under various top layers. 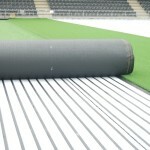 For natural grass the heating system will be installed at 25 – 30 cm under the pitch to prevent damage to the heating system during periodic maintenance. The heating of natural grass will improve the root growth of the grass and thereby accelerate and improve the recovery of the grass. When artificial turf is applied, the heating ribbons will be installed as close to the turf as possible. In cooperation with our suppliers we have developed special FIFA certified shock pads for our heating ribbons. This combination results in an efficient way of heating in which the shock pad is used as isolator. 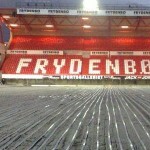 Nowadays hybrid grass is on its way to conquer pitches. 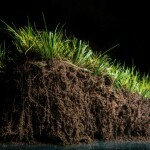 We also offer solutions for this option which offers the best of natural grass as well as artificial turf. We work in close cooperation with a number of suppliers of hybrid grasses.